Interim results pending any challenges over the next week – we will then publish the aggregate and team winners. We need to thank all the Range Officers and Volunteers who are the backbone of our sport. They did a stellar job over the weekend, working in very tough conditions, to ensure everyone had a safe and enjoyable weekend. John Paul Craven and all the crew from MNSCI had the ranges in top order and worked away all weekend, before many were even out of their beds, to make sure everyone had a great time. John Reynolds and Co. kept everyone fed and watered over the weekend, even when we had larger than expected numbers on Saturday. In what were difficult shooting conditions, they put in some great scores. 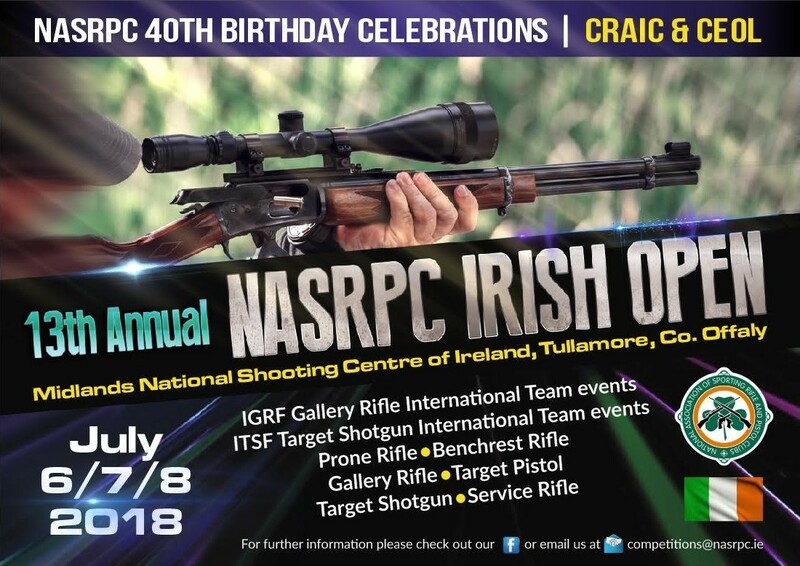 We had many of them at their first Irish Open, many raising an International medal for their efforts, alongside people with numerous caps for representing their countries and people who have been shooting all 40 years of the NASRPC, and still proudly winning International medals. With competitors in their teens shooting alongside competitors in their ’70s – all having an equal chance of winning – it truly is a great sport we have. Many, many personal bests were recorded, scores that would be assumed to be a Gold in the bag, fell to yet higher scores, as the weekend progressed and even a record or two fell to people shooting at their absolute best. Again this year we held a Raffle to raise funds for Development within the NASRPC Club Network. We had a very impressive prize table with some very high value items including a number of firearms. Special thank you to all who contributed. See Fundraising Raffle page. On the IGRF front, Ireland and Germany faced off in both the GRSB1500 and GRCF1500 team events. Unfortunately NRA were unable to field GB teams in the Irish leg of this years IGRF International Series. The German teams had the difficult task of beating the reigning World Champions, Ireland, on home soil. In the end, in very hotly (pun intended) contested events, Ireland took first place in both events, narrowly beating very good German performances. Everyone is already looking forward to the German Leg of the series in Leitmar in November – when we find out if Ireland are good enough to beat Germany on home soil. We hope everyone enjoyed themselves, have some great stories to tell of their exploits during the event and we look forward to seeing what everyone does next.